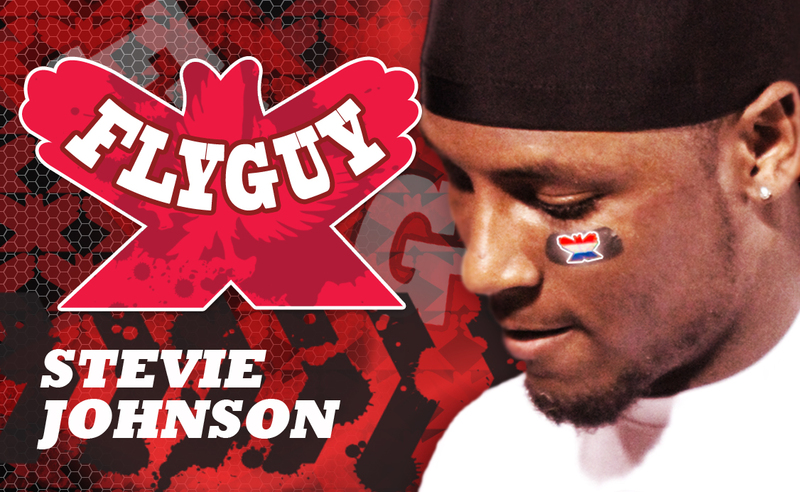 From his college career at the University of Kentucky to his current position in the NFL with the Buffalo Bills, EyeBlack.com has helped Stevie Johnson find that swagger that helps him enjoy the game and feed off of the energy of the crowd. Now you too can catch a little bit of Johnson’s style with the new Stevie Johnson branded line of EyeBlack! Designed by the athlete himself, you’ll have that fearless swagger while still getting unbeatable protection from the sun’s glare. Stevie played a key role in designing his custom line of EyeBlack. His signature hand gesture, known as the FlyGuy, mimics the shape of a bird's wings and is present on each design. It signifies the positive, uplifting personal philosophy that Stevie lives by, which drives him to continuously pursue his passions: fashion, family, faith and football. Stevie's family, friends and fans are referred to as his “Wing Team” as they are people who share the same values and strive for excellence in each avenue they pursue, whether it be athletics, academics or a personal passion. These individuals maintain a positive and uplifting mind-set that creates positive, productive members of society. Purchase your favorite Stevie Johnson EyeBlack and join the Wing Team today!